Ed. Note: In July of this year, the owners of CK's Coffee Shops, a venerable and much-beloved local chain of all-night diners, announced that they were closing seven locations. Only three locations – the ones retained by the original owners – remain open. Last weekend, a few friends and I holed up at the Midtown location, documenting what 24 hours in the life of the coffee shop – the people we met, the sounds we heard, and the meals that we ate. This is what we found. Our adventure began at 9 a.m. on Friday, September 28. CK's Meal No. 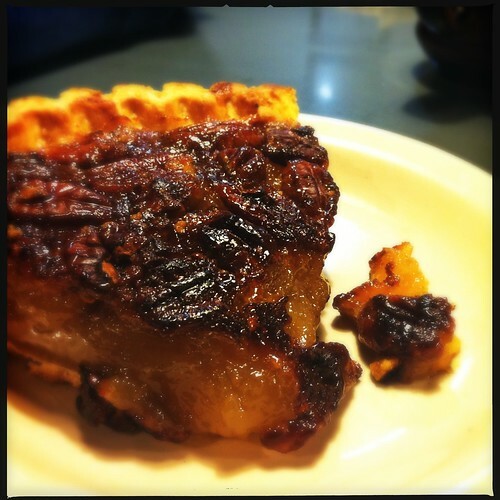 1, 9:30 a.m.: slice of apple pie, glass of iced tea. Since I was planning to spend the whole day at CK's, I thought I'd start off light. The apple pie didn't exactly taste homemade and it looked a mess on the plate, but it was surprisingly good. I love patty melts. It's impossible to mess up a patty melt. 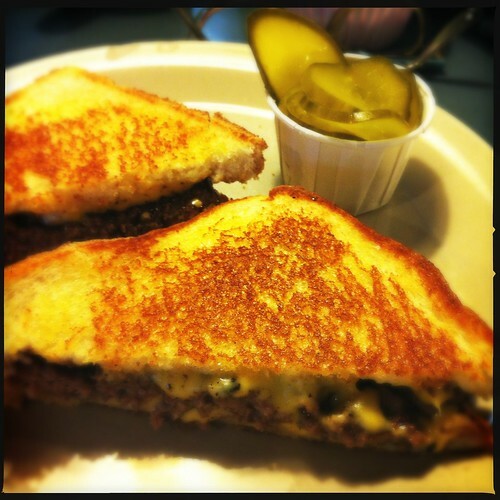 It was greasy and cheesy and came with a whole cup of pickle slices (which I ate with a fork). The apple pie was way better. CK's Meal No. 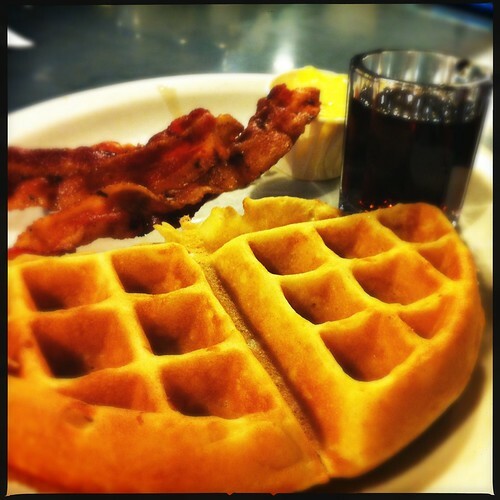 4, 1:30 a.m.: Half a waffle, side of bacon. Inspired by the pack of Rhodes girls at the counter (you'll meet them in a minute), I ordered half a waffle and a handful of bacon. This was by far the best thing I ate all day. Because it's open all the time, CK's attracts all kinds of people. Some of them are very friendly. Some of them are drunk. Others have good advice, strange eating habits, loud friends and, in the case of one man we met, a lot of ideas about the way the world is run. Around 4 p.m., Jen left to go to work and Eugene and I took over. We grabbed the corner seats and the bar. Eugene: Kerry and I sat between two older gentlemen (I believe they were in their 60s and 70s respectively). The man to my left brought portable speakers and hooked his ipod up to them, playing weird 90s R&B slow jams the whole time. Kerry: I admired his moxie. He was totally bypassing the jukebox and blasting songs, then changing them halfway through. At first, I thought he was trying to seduce the waitress. Eugene: We started talking about health, life, and the grand spirit helping people quit smoking. It was weirdly illuminating but kind of hilarious. By the end, one of them was talking about the illuminati and how the next group of people that the secret society would choose to eliminate in the world would be the Taiwanese. But for those few hours, before the mild crazy set in, it was the most memorable conversation I've had in recent memory. Kerry: What Eugene left out is that the conversation started when the man sitting next to me – the older of the two – poured a vial of ginseng into his coffee. We talked to these two men for about an hour and never found out what their names were. Once they were done, they just got up and left. Eugene: But weirdly, the conversation I had with them about quitting smoking helped keep me from smoking up to this day. So, I guess in that respect, I have to thank that old crazy illuminati-obsessed man. Rosette, the lone CK's employee on duty between 4 p.m. and 10 p.m. She was super nice, didn't ask us too many questions about why we were there so long and she kept our coffee mugs full. Rhodes business major Emily Shields stopped at CK's on the way home from a fraternity party with a few friends. 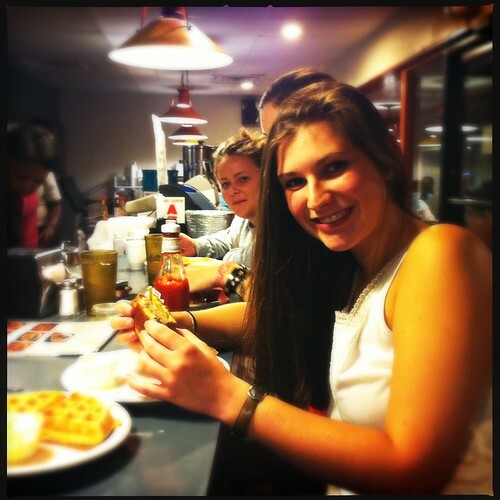 She was eating – and by eating, I mean completely housing – a patty melt and half a waffle. 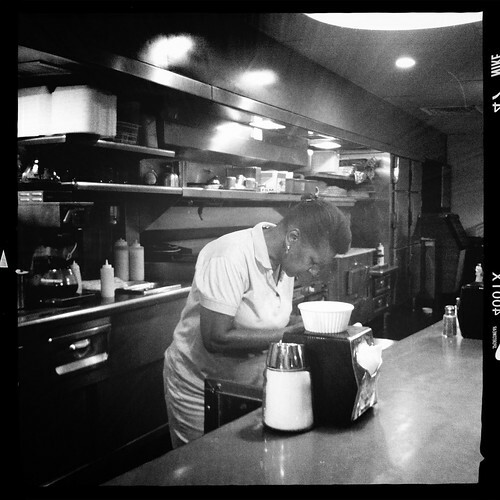 She's my CK's dining hero. 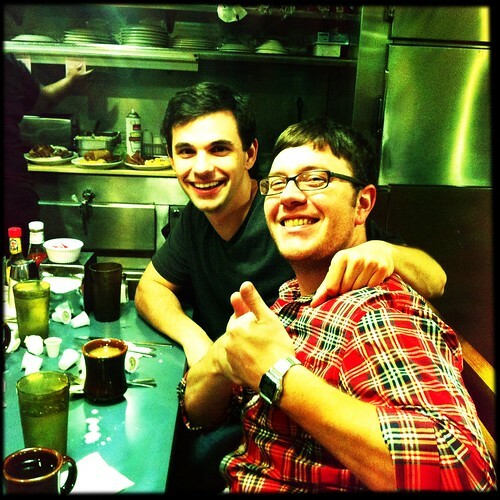 This is Blake and Spencer. They were finishing up a night at the bars at CK's with their friends Liz, Lauren and Matt. They were the friendliest people I met all day. As the night drug on and our caffiene buzz turned from pleasant to uncomfortable, we started making a list of everything we had learned about CK's throughout the day. 1. Spending 24 hours in a place always seems like a good idea. In retrospect, it's always way longer than you think it is. 2. Fifteen coffee refills is too many. 3. If you ever want to be alone in a CK's, the best times are 9 p.m. and 12 a.m.
4. 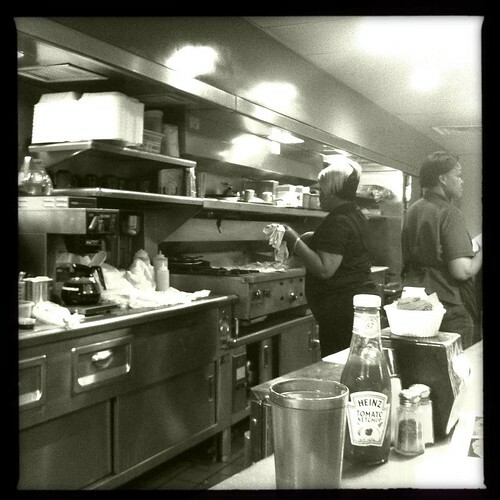 Before the super late night rush, the kitchen staff preps by pre-cooking massive piles of bacon. They don't cook it all the way, just enough to save time when the orders start rolling in. This woman is holding a fistful of bacon. 5. The CK's at Evergreen and Poplar has a great jukebox. It's full of soul and R&B from the Stax era to the present. At 2:30 a.m., the staff turns the jukebox up. 6. R. Kelly's "Ignition Remix" is number 1510 in said jukebox. 7. If you stay at CK's long enough, your skin will start to feel like it's coated in a layer of grease. Your clothes will smell like bacon. 8. Most of the people in this city are super nice and really receptive to your crazy ideas. Some of them will show up to keep you company. Some of them will tell you stories. 9. The food at CK's is surprisingly good for the (very low) price, especially the bacon, waffles and patty melts. 10. This is the most important lesson: If you stay at CK's long enough, you become one of the crazy CK's people. During her shift, Jen made a CK's themed alphabet coloring book. You can download selected pages (like "Q is for Quiet or You'll Get Kicked Out) here. Ed. Note: A huge thank you, tons of hugs and all the sleep in the world to my intrepid friends Jen and Eugene for their help with this story. They're amazing. Also, thank you to Ted Gorman, John Jester and Len Pipkin for their company and to Jon McIntosh for the gifts. Mostly, thank you to all of the staff and people we talked to at CK's. Thanks for not kicking us out. I am enjoying Jen's coloring book pages very much. Thank you. B.) I hope that you know that I had I been in Memphis I SO would have been there. My father was the regional manager of CK's in the 90s. Imagine all the weird stuff that goes on in a 24 hour diner and the manager's job is to take care of the weirdest of the weird every night. Drunk fights, group dine and dashes, robberies, lovers' quarrels, and more would get called in. The craziest is probably when a shift decides to quit and walks out, leaving the diner unlocked. It doesn't take long for customers to start Machiavellian strategies and developing a Lord of the Flies society where the bacon, waffles, and cash register are free game. Isn't Fistful of Bacon the new Eastwood flick? Having spent better part of my college career from 1990-1995 at Memphis State / U of M, I would love to hear more stories from Valibus or his dad. Maybe you/he could write up a guest article one day as I bet there are more than just me that would appreciate the stroll down memory lane.